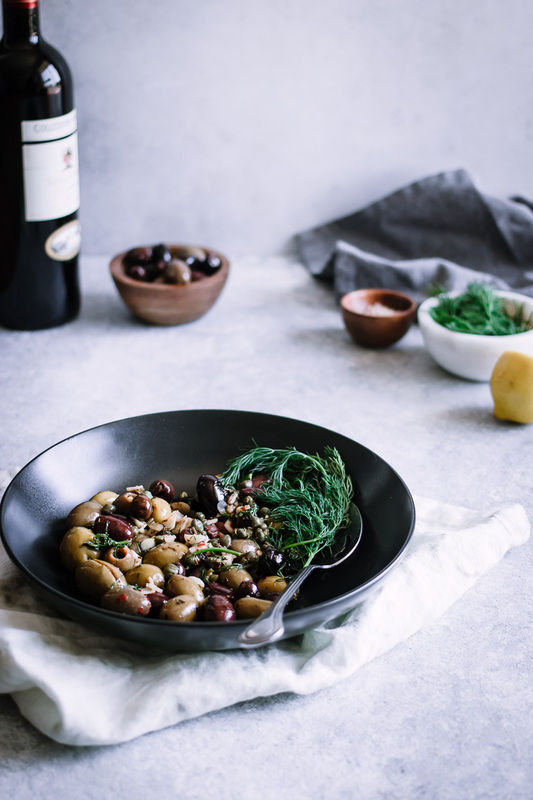 Warm marinated olives, garlic + capers with fresh herbs. Heat brings out rich complex flavors in this Spanish-inspired recipe! Warm marinated olives, garlic, and capers with fresh herbs. Heat brings out rich complex flavors in this Spanish-inspired recipe! Let me just preface by saying I have not always love olives. In fact, I downright hated them until well past the age thought to be a proper adult (I spent years as an early adult not really acting like one). Growing up in the American Midwest my experience with olives was limited to sliced tasteless black olives that came in a can. You can see why this was not an appealing ingredients throughout my formative years, however when I came of age one thing changed my tune toward olives…. Yes, it was the dirty martini that allowed me to appreciate the salty complexity of olives and their juice and I will fully admit it. Once I became open to the flavorful little fruits there was no stopping me. Olives on pizza, olives on sandwiches, olive tapenade, olives baked in bread, olives just plain eaten from a jar…I love them. When I first married Francesco (the Italian husband) and spent a summer in Italy with his family one of my favorite things to do was help his mother in the kitchen. We often prepared a simple platter of olives from trees in their yard, which I loved. And they thought nothing of. The ancient twisted beauty of the olive tree. Olive trees routinely live for centuries, with the oldest known living olive tree is 3000 years old on the island of Crete. It is believed the first trees to produce an olive fruit rich in oil were along the Mediterranean, in what is now Syria and Crete. Where olive trees were first domesticated is unknown, but olive oil has been an integral part of Mediterranean diets for thousands of years. 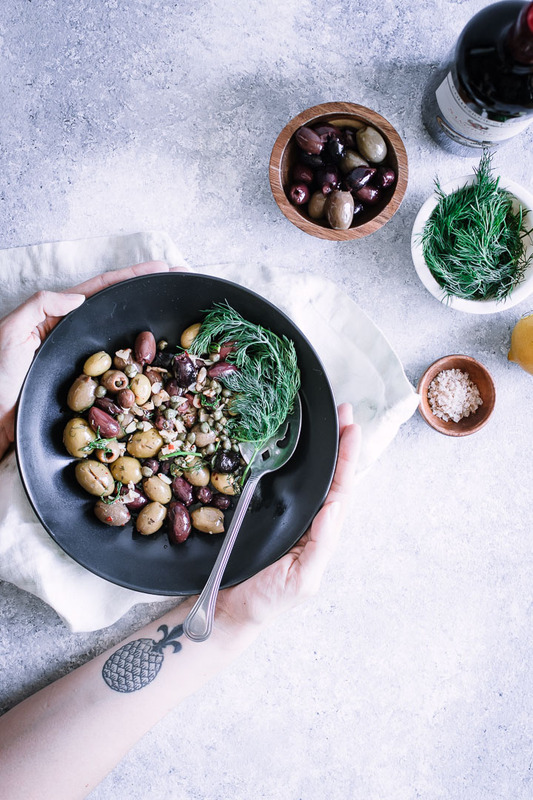 In fact, it can be argued that olive oil is the foundation of the traditional Mediterranean Diet, which is one of the healthiest and most sustainable eating patterns. Warm marinated olives: endless flavor possibilities. Warming olives is a great flavor booster as it brings out the richness of the herbs, garlic, and olives. 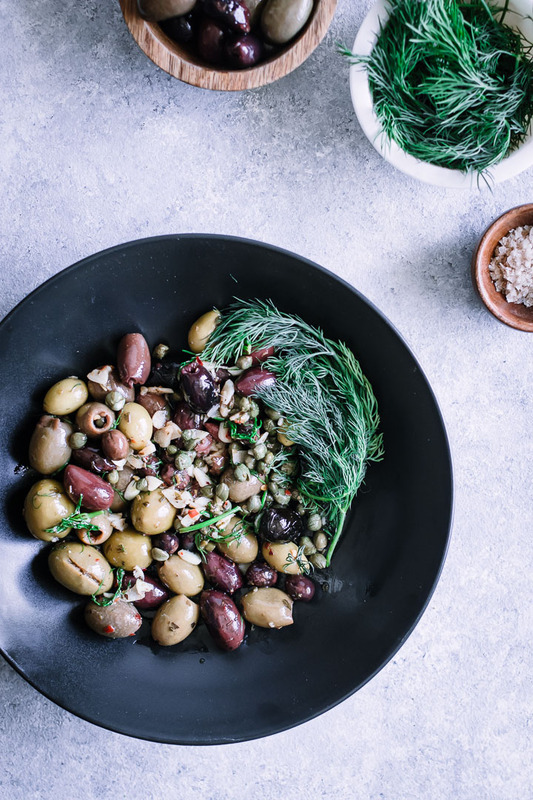 Many Mediterranean cultures–from Spain, Italy, to Greece–warm their olives before serving with a bit of bread and cheese (and wine, of course). This recipe for Warm Marinated Olives is simple enough that it requires no more than a small pan. However, I have found a small ceramic bowl I scored in a market in Korea to be the perfect cooking pot that also doubles as a serving dish. The ceramic pot can be placed right on the stovetop burner and then transferred to a heat safe holder. This way the olive mixture will stay warm on the table, which is perfect for when you are serving guests. I hope you enjoy this simple, pickable olive recipe! It’s a great choice for a starter or to add to a cheeseboard or platter when having guests. Use it as a foundation, mix in other ingredients like onions and peppers, and make it your go-to easy dish for wine and cheese nights. Craving more simple starter recipes? Check out our Mexican-Style Three Bean Salad and Roasted Beet Fries recipes, both easy plant-based starters that come together in under 30 minutes. Did you make this Warm Marinated Olives recipe? Leave a comment below and rate the recipe to let us know how it turned out. Save this recipe for later by pinning to your favorite appetizer Pinterest board and make sure to tag me on Fork in the Road’s Instagram to show me your olive creations! 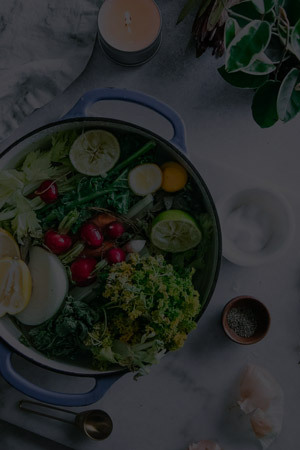 Heat olive oil in a hot pot or small pan over medium-low heat. 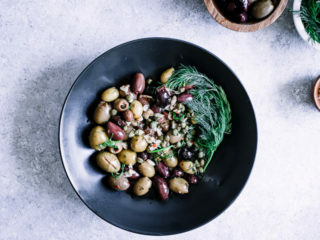 Add olives, garlic, capers, olive oil, lemon juice, herbs, salt, pepper and red pepper and heat about 5 minutes, or until olives are warm and herbs have wilted. Notes // Tips: Keep heat low and don’t overcook olives. For more flavor, cook garlic first until starting to brown, then turn down heat and add other ingredients to finish before serving. Leftovers & Storage: Olives will keep well in an airtight container in the refrigerator for up to five days. However, after heating once I would not recommend reheating again or they may have a harder texture and will not be as soft with repeated warming. 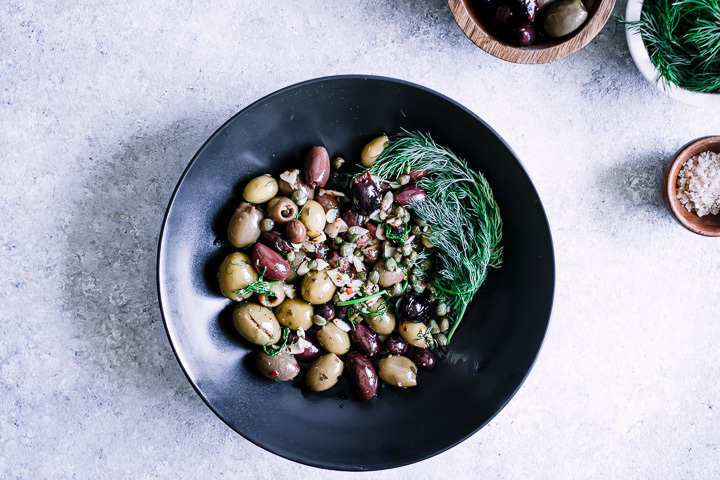 Nutrition facts: Olives are high in healthy monounsaturated fats and are an important part of the Mediterranean Diet, named one of the most sustainable eating patterns! Ahh, so that explains why I hate black olives so much! I also grew up in the midwest and those gross things were always in a little divided crystal dish along with green olives at the various holiday and family get-together tables. I like your version much better! Going to keep this for a holiday table replacement and I am sure it will be highly appreciated. I know, I always hated the tasteless black olives! But the dirty martini changed my mind. 🙂 This recipe is so simple but it looks like you spent much longer on it than you really do, which is usually my overall goal when cooking. Let me know how it goes and thanks for stopping by! I love olives! I always just buy a jar and then eat them straight but this is a good idea to mix them with herbs. I’ll definitely try it. I’m the same, they’re the perfect little snack. But with a little herbs and oil they become a bit “fancier.” Enjoy! I loved all the olive plates when I traveled in Greece but I never thought of making them myself at home. I’m definitely trying this! I love them too! My husband is from Italy and I am always inspired by the simple, yet flavorful, ingredients when we go back to visit his family.